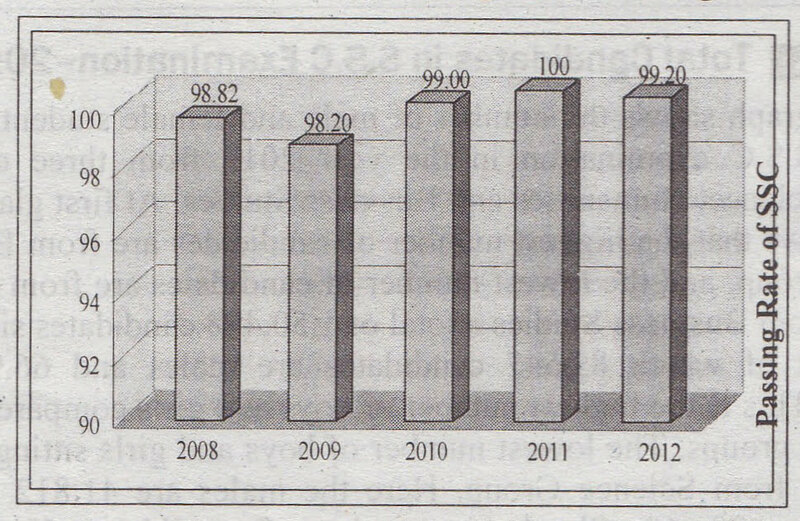 Answer: The graph shows the passing rate in SSC examination in BAF Shaheen College from 2008 to 2012. The overall rate of passing is bright enough, and it is not less than 98.20%. The passing rate ranges between 98.82 and 100. The highest rate is 100%, and that was in the year 2011. The lowest rate is 98.20%, and that was in 2009. However, a rise and fall trend is noticeable from the chart. In 2008 the percentage is 98.20, the next year that is, in 2009, it slightly falls to 98. 20%. Again, in 2010 the rate slightly increases to 99.00%. This trend of increase persists in the next year. Thus, in 2011 it becomes the highest, that is, 100%. Again, there is a slight fall in the next year. Thus, in 2012 it becomes 99. All these trends of SSC exam between the years 2008 and 2012 have been shown in the graph.